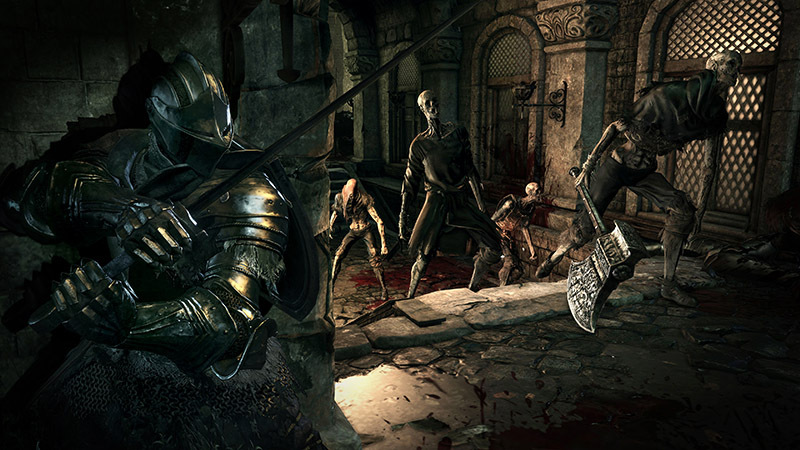 Worried that another Dark Souls might be too much, too soon for From Software? Two words: Don't be. Last Thursday's Dark Souls III event could easily be called The Last Temptation of the Gaming Press if we weren't already inured to such spectacle. All of these admittedly generous pleasantries only served as distractions from the reason we all braved the two-hour bus ride alongside endless stretches of bucolic vineyards: The chance to play a tiny sliver of From Software's Dark Souls III, due out sometime in 2016. And while it's impossible to judge the final state of From Software's next RPG based on a 90 minute session missing many notable features, what Namco-Bandai had to show at last week's event definitely has me feeling optimistic about Dark Souls' future. While the demo's castle keep setting—known as the "Wall of Lodeleth"— resembles similar environments from past Souls games, my short time with Dark Souls III at least revealed some brand-new additions. Without a doubt, the biggest change for this Souls sequel can be found in its "Battle Arts," new movesets that activate with a press of the LT button (or L2 on a PS4 controller). This change pushes Dark Souls III a half-step towards Bloodborne's combo-friendly "trick" weapons, giving each type of arms a set of unique set of special attacks that help make them feel more distinct from each other. Some of the minutiae and terminology may only make sense to Souls veterans, but holding in LT with a short sword equipped, then tapping RB or RT sends characters plunging forward with some stamina-draining—but extremely powerful—plunging and sweeping attacks. The other weapons available in the demo offered some completely different takes on Battle Arts, too: Tapping LT with an axe equipped gave my hero a temporary buff, while the same action using a longsword dropped my character to one knee, which I could then combo out of with some strong strikes. These Battle Arts abilities can't be abused, though: A UI element tracks how many you have remaining, and though your supply refreshes every time you die or rest at a bonfire, it's incredibly easy to burn through the relatively small amount (20 in the demo) with a single run. Shields play an interesting role in Battle Arts, especially for those who've mastered the art of parrying and riposting—one of the harder systems to grapple with in the Souls series. Keeping this in mind, it seems as if From understands a good portion of players aren't interested in using these tricky counterattacks, so certain shield types omit this feature entirely. Some, like the round one I used for most of the demo, fall into this category: hitting LT instantly put my character into a two-handed "power stance," eliminating the need to toggle in and out of it on the fly for the sake of using Battle Arts. The standard kite shield I picked up later performed a standard shield bash with LT, meaning I first had to hit Y to enter a "power stance" before performing any of my weapon's Battle Arts. 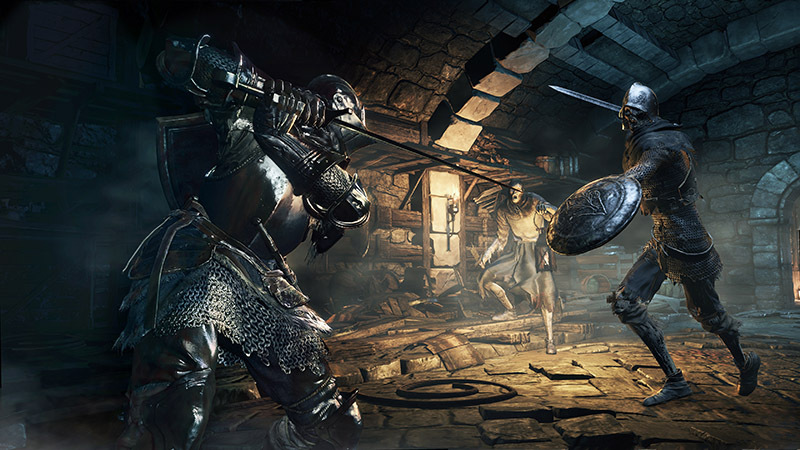 It's a difficult arrangement to describe without weighing down sentences with jargon (so apologies for that), but, in simpler terms, Dark Souls III allows players to prioritize between the standard parrying and riposting and the new Battle Arts system—good news to anyone out there (like me) who could never nail down the former. As for the Wall of Lodeleth, it offered a similar experience to other castle-themed Dark Souls environments of the past, but with a few new surprises. The standard dregling, soldier, and dog-type enemies had me thinking this might end up being an earlier level, especially with the amount of non-violent, corpsey enemies scattered about. I soon learned to take these formerly non-threatening creatures a lot more seriously, though: A certain enemy carries a lantern that can stir these docile foes to life, which ended up getting me cornered and murdered on more than one occasion. And, of course, the standard Dark Souls Dragon makes yet another appearance, this time breathing deadly fire down two different pathways. Sneaking around these deadly attacks required baiting him into blasting the upper level with flame, then dropping down below to the lower level and fleeing before he could notice—all while toasting pursuing enemies in the process. I had a great time with this tiny morsel of Dark Souls III, but this short demo only revealed the basics to me. I have a good feeling for how Battle Arts work, but any hint of lore didn't make its way into this early version, and we also didn't get a chance to experiment with any of Souls III's multiplayer features. Like any Dark Souls level, the Wall of Lodeleth gave some hints of a larger story, with ashen-themed enemies worshipping petrified dragons, and the strange existence of trees made from corpses, but I only had these visual cues to rely upon. And, unfortunately, some poorly timed power outages during the session meant I couldn't reach the demo's boss, a huge humanoid creature known as The Dancer of the Frigid Valley. While I couldn't take on this dual-wielding (one fire sword and one ice sword) boss on my own, I'm at least consoled by the fact that I had the chance to witness one of the best Dark Souls runners pull off this feat with no Estus and a tiny sliver of life left. Unfortunately, there's not much more to say about my all-too-brief time with Dark Souls III, though I did notice ragdoll corpses and blood make their return for this newest installment—you may remember these features were excised in Dark Souls II, most likely to help it get a Teen rating. (The "Praise the Sun" emote is back as well, as if you had any doubts.) And even though I left the event wanting to see more, what the demo had to offer didn't send up any warning flags; like Dark Souls II, part III feels like yet another refinement of an experience I absolutely love. And, until I get sick of it, it's impossible to imagine there ever being such a thing as "too much Dark Souls." Tagged with Bandai Namco Entertainment,	Dark Souls,	dark souls ii,	Dark Souls III,	FromSoftware,	Previews,	USgamer.